The Atlas Cheetah is a South African fighter aircraft developed for the South African Air Force (SAAF), and currently operated by the Ecuadorian Air Force (FAE). It was developed as a major upgrade of the Dassault Mirage III by the Atlas Aircraft Corporation (later Denel Aviation) in South Africa. The Cheetah integrated technology from the Israeli IAI Kfir, which was derived from the Mirage V/IAI Nesher. The Cheetah Es were retired in 1992, and the Cheetah Cs and Cheetah Ds in April 2008, being replaced by the Saab Gripen. A limited number are still operated in South Africa as flight test aircraft. Some will be used in DACM training in the US. One Cheetah R was built as a prototype but never entered service. 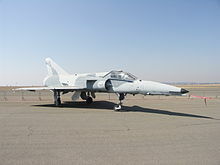 The Atlas Cheetah programme grew out of South Africa's requirement for a modern fighter and strike aircraft in the 1980s. There was a need for more advanced aircraft to attain an edge over the ever more sophisticated Soviet aircraft such as the MiG-23 being supplied to Angolan and Cuban forces in action against South African forces in the Border War. Furthermore, the increasing cost of maintenance due to sanctions and the age of the aircraft used by the SAAF had to be addressed. The arms embargo imposed at the time by United Nations Security Council Resolution 418 prevented South Africa from purchasing new aircraft from other countries, thus making an upgrade of existing aircraft the only option. By this stage, the South African aviation industry had reached the level of technical capability to make a large and sophisticated upgrade possible, leading the SAAF to make the only possible decision: to extensively upgrade one of the existing types in service while an advanced indigenous fighter, the Atlas Carver, was under development. 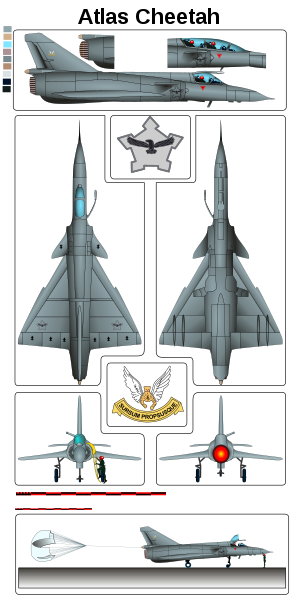 At the time the SAAF's fast jet fleet consisted of Dassault Mirage III (EZ/CZ/BZ/DZ/D2Z/RZ/R2Z) and Mirage F1 (AZ/CZ) aircraft. Though the Mirage F1s were the most modern of the fleet, having been delivered from 1977 onwards, they were the primary element of South Africa's air defence and strike fleet and to withdraw them for an upgrade would have left an unacceptable gap in its air defence and strike capability. In addition, features could be integrated into the Mirage III from related, pre-existing upgrades to related aircraft, such as the Mirage V/Nesher/Kfir lineage and Mirage 3NG project (based on the Mirage III). Consequently the SAAF's Mirage III fleet was chosen as the basis for the upgrade, to be known initially as Project Cushion. Israel was already selling military technology to South Africa through the Israel–South Africa Agreement. For example, Mirage III spare parts were bought in Israel and Israelí advisors were embedded in SAAF units. The work was carried out by Atlas Aviation (formerly Atlas Aircraft Corporation and lately Denel Aviation). Atlas was also able to acquire skilled technicians with relevant knowledge from Israel, following the cancellation of an advanced Israeli fighter project, known as the IAI Lavi. The upgrade consisted of a complete refurbishment of the airframe down to zero hours (in which some 50% of the original airframe was said by Atlas to have been replaced), the fitting of non-moving canards (Cheetah D & E having slightly smaller (70%) canards than that of the Cheetah C and Kfir) just aft of the engine intakes, two new stores pylons at the wing roots, an aerial refuelling probe, new ejection seats, a more powerful engine (the SNECMA Atar 9K50C-11 [upgraded in South Africa]) in the D and C variants, a new main wing spar along with a new "drooping" leading edge and a dog-tooth incision on each wing, modern elevons controlled by a twin computer flight control system, and strakes on the nose to improve the Cheetah's high-Angle of attack (AoA) performance. A new avionics, radar, EW and self-protection suite was installed, necessitating a lengthening of the nose. This entailed the fitting of an EW suite which included missile and radar warning sensors. 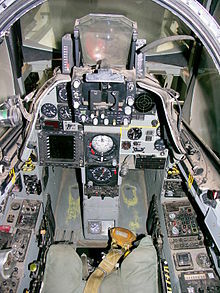 Other features included the aircraft's self-protection system, which consisted of electronic jammers and chaff/flare dispensers that activated automatically; the integration of a South African helmet-mounted sight and an oversized head-up display (HUD); the installation of a Pulse-Doppler radar and sophisticated cockpit instrumentation. Some aviation publications suspect that Israel Aircraft Industries was involved in at least the initial stages of the upgrade, and that some components were sourced direcly from Israel. Five IAI Nesher fighters may have been acquired from the Israeli Air Force for Cheetah trials and later absorbed into the existing fleet. The date of completion is unknown, but the first Cheetah D was officially unveiled on 16 July 1986, by which time a number of Cheetah Ds had already entered service with 89 Combat Flying School at AFB Pietersburg, though the type was only declared operational in 1987. The second and third aircraft to be delivered to Atlas were both Mirage IIIEZs, and the resulting Cheetah Es went into service with 5 Squadron at AFB Louis Trichardt. 16 of each type were in service by 1991 when the Cheetah D and E conversion lines closed, by which time the first of the 38 Cheetah Cs were being converted, with the first being rolled out in January 1993. All the Cheetah Cs entered service with 2 Squadron, also at AFB Louis Trichardt. The Cheetah C was the final development in the Cheetah series and was the only fighter aircraft in service with the SAAF until replaced by the Saab JAS 39 Gripen in 2008. In addition to the upgrades described above, the Cheetah C incorporated more sophisticated avionics and navigation suite and an improved pulse-doppler multi-mode radar (ELTA). The aircraft was also fitted with a data link and updated versions of the helmet-mounted sight, HUD and improved HOTAS controls. Other improvements included the fitting of a single-piece wrap-around windshield with an anti-radiation coating in place of the previous three-piece version, a revised in-flight refuelling probe with less external piping, new undercarriage and suspension, the deletion of the wing fences, an upgraded version of the Atar 9K50 engine and a new nose to incorporate the more sophisticated electronics and radar. Like the Cheetah D, the Cheetah C was capable of delivering precision-guided munitions (PGMs), ranging from laser-guided bombs (LGBs), to GPS-guided weapons and TV-guided bombs. It also had the capability of using stand-off air-to-ground weapons such as the MUPSOW and TORGOS. In addition, it was able to carry a wide range of air-to-air weapons including the V4 R-Darter radar-guided missile and the A-Darter infrared (IR)-guided missile. The Cheetah D was the sole two-seater variant, and was predominantly used as a trainer for pilots converting to the Cheetah C. It also had a secondary attack capability, including the ability to deliver PGMs. Under Project Recipient, 10 Cheetah Ds were re-engined with the Atar 09K50C-11, replacing their original Atar 09C engines. After the engine modification, the remaining aircraft received an avionics upgrade to bring them to the same standard as the Cheetah C. The original three piece front windshield was also replaced with a one-piece wraparound version. A Cheetah E on static display. Cheetah D No.845 was based at the Test Flight and Development Centre (TFDC) as a systems testing aircraft and used in the development of the Denel Dynamics MUPSOW stand-off weapon. Denel used two Cheetah Ds for testing (844 and 847). The former was Denel's standard systems testing aircraft, while the latter was used in the evaluation of the SMR-95 engine, a development of the Klimov RD-33. The performance increase offered by the Russian engine was impressive, but budget cuts and problems with the aircraft's centre of gravity ended the program. These aircraft were retired from service in 2008, as the first JAS-39D Gripen began to be delivered to the SAAF. The single-seater Cheetah E was developed as an interim fighter for use in the period before the Cheetah Cs became operational. It was fitted with a comparatively simple avionics suite and radar and retained the Atar 9C-3 engine. Its typical mission was as a standby interceptor, whereby a minimum of two aircraft armed with two V3B (later V3C) missiles, would be on permanent alert status in case of an attack from the north. All aircraft were placed into storage with the final example (No.842) painted in a non-standard camouflage scheme and used for systems testing. No.842 is currently with the SAAF Museum, and is stored at AFB Swartkop. In 2003 Chile purchased five of the mothballed aircraft (Numbers 819, 820, 827, 832 and 833) and indicated its desire to purchase seven more aircraft (numbers 822, 823, 825, 828, 829, 831 and 834) subject to the agreement of a suitable purchase price. The Chilean Air Force (FACh) used the Cheetah E airframes as a source of spares for its similar ENAER Pantera aircraft until these planes were retired in late 2006. The Cheetah R was a feasibility study into an extension of the Cheetah upgrade programme to include a specialist reconnaissance model. An Atar 9K50-engined Mirage IIIR2Z, (855), was chosen as the airframe for the upgrade. In addition to the airframe refurbishment, 855 received a new nose design and the same radar as used in the Cheetah E, the twin DEFA 30mm cannons were removed and it was the only Cheetah type to not receive an in-flight refuelling probe. The SAAF decided not to proceed with the Cheetah R programme and 855 was assigned to the Atlas Advanced Combat Wing (ACW) where it was used as a testing and development aircraft. It was decided that rather than developing a dedicated reconnaissance airframe, that the Vinten Vicon 18 Series 601 reconnaissance pod would be used on the Cheetah C variant to provide reconnaissance capabilities. Ecuadorian Air Force – On 23 September 2009, the Ecuadorian Ministry of Defense announced that Ecuador had reached a decision to buy 10 ex-SAAF Cheetah Cs and 2 Cheetah Ds to replace its aging fleet of Mirage F.1JAs in one of the Ecuadorian Air Force's two operating supersonic fighter squadrons. After some delays, a contract was signed in December 2010. The first three aircraft arrived Ecuador on April 2011. Denel Aviation – As of October 2012, the state owned company operates two Cheetah D as system testbeds. They are based at Denel Aviation's facilities at O.R. Tambo International Airport. Draken International – In December 2017, it was announced that the company would buy and operate 12 ex-South African Air Force Cheetahs. South African Air Force – Entered service in 1986 and retired from active service in 2008. Missiles: 2× Python 3 AAMs, V4 R-Darter (BVR missile), A-Darter, V3C Darter and/or Matra R530 missiles. ^ a b "Dassault Mirage III & Mirage 5/Nesher in Israeli Service". ACIG. 2003. Archived from the original on 26 July 2014. Retrieved 2013-08-09. ^ Olivier, Darren (14 November 2016). "Project Carver emerges from the shadows". Randburg: African Defence Review. Archived from the original on 12 December 2016. Retrieved 25 January 2017. ^ Geldenhuys, Deon (1990). Isolated States: A Comparative Analysis. Cambridge University Press. ^ "Atlas Cheetah Multi-Role Fighter". Military-Today.com. Archived from the original on 10 December 2008. Retrieved 2008-12-20. ^ Sparke, Capt. Colin (2007). Du Toit, Maj J.V., ed. "Cheetah aircraft". Ad Astra magazine. 27 (2): 10. Archived from the original (PDF) on 12 April 2014. Retrieved 12 April 2014. ^ "THE AIRFORCE — AIRCRAFT — CHEETAH E". Retrieved 2008-12-20. ^ "Ecuador to buy 12 modified Mirage aircraft from South Africa" (in Spanish). Retrieved 2009-09-24. ^ "Cheetahs and Mirage 50s for Ecuador". 15 December 2010. Retrieved 2010-12-15. ^ "Aerospaceweb.org — Aircraft Museum". Retrieved 2008-12-20. Breffort, Dominique; Jouineau, Andre (2004). The Mirage III, 5, 50 and derivatives from 1955 to 2000. Planes and Pilots 6. Histoire et Collections, Paris. ISBN 2-913903-92-4. Eden, Paul (ed.). The Encyclopedia of Modern Military Aircraft. London, UK: Amber Books, 2004. ISBN 1-904687-84-9. Pérez San Emeterio, Carlos (1978). Mirage. Espejismo de la técnica y de la política. Armas 30 (in Spanish). Editorial San Martin, Madrid. ISBN 84-7140-158-4. Wikimedia Commons has media related to Cheetah_(SAAF).